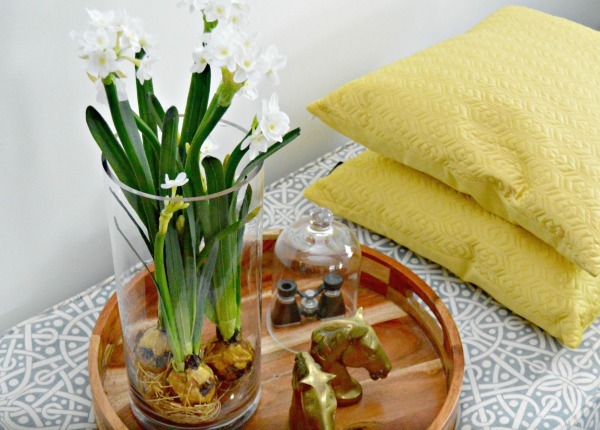 Today I’m sharing a small home tour with tons of ideas you can grab and DIY! I see tons of large home tours, and most of them are so stunningly beautiful, but feel very unattainable for most of us. No worries, today I’ve gotten together with 12 of my blogging friends to show that you don’t have to have a large home to have a beautiful home…and you don’t have to have a ton of money either. 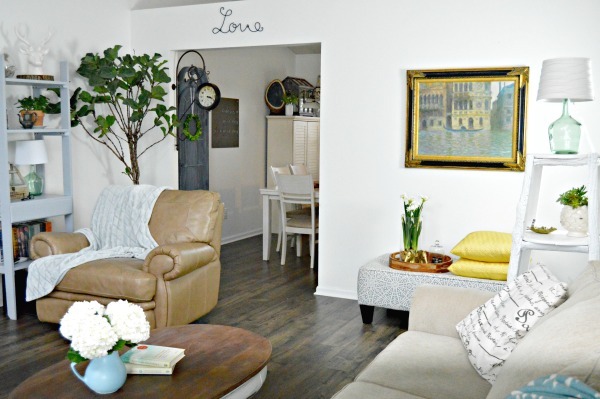 I hope you can grab some inspiration and make some simple changes in your small (or large) home, and really learn to love the home you live in! 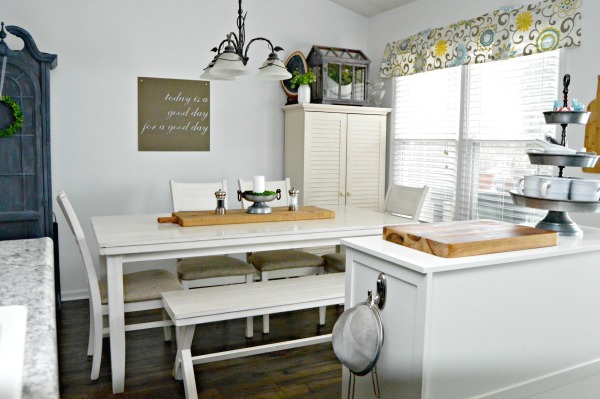 I’m so excited that my blog friend, Stacy from Not JUST A Housewife put this Small House Tour together! She’s first up on the tour today, so be sure to check her out after you tour my little house! If you are a first time visitor, I encourage you to take a look at my Home Tips Page while you are here! I share hundreds of DIY Cleaning Solutions and Budget Friendly Home Tips to make life easier! Next on the home tour will be my friend Abby from Just a Girl and Her Blog…she has the cutest style and is all about organization…you will love her! I’m going to walk you through the the main floor of our home and show you a few inexpensive DIY ideas along the way. We have talked about moving into a larger home many times through the years, but I honestly love our home and the coziness it provides. I think living in a small home has made our family stay close. Sometimes it’s a struggle, and storage can be a real issue, but if you just get a little creative, living in a small home can be amazing! 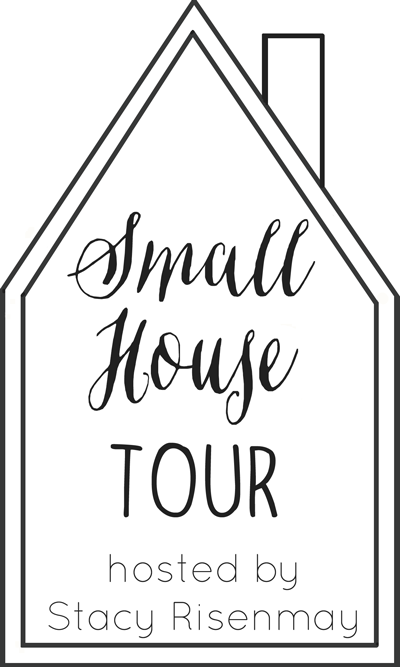 Don’t forget to check out all of the other ladies that are sharing their small home tours today and tomorrow! I’ll be linking to 5 more today and I’ll post links to the other 6 tomorrow. Let’s start in the living room, shall we? This is what you see when you first walk into our home. As you can see, I love whites and blues. I guess if I had to describe my style, it would be thrifted, cottage style…with tons of plants. I have plants EVERYWHERE in our home…a little known fact about me, when I was little, I wanted to be a botanist. I once turned the back room in our home into my laboratory. I dug up every flower, plant and weed I could find and planted them in cups and bowls so I could study them. Needless to say, that didn’t pan out, but I still have a strong love for plants. A few little details about our living room…that huge chalkboard above the mantel used to be a mirror on a dresser. I just painted it and it’s been there for a few years now. You can find the tutorial HERE! The TV console is actually a shelf from Target. The plant behind my husband’s leather chair (which I try to camouflage with a blanket), is a Fiddle Leaf Fig plant. If you ever read Better Homes and Gardens, then you have probably seen one. I am absolutely in love with them, and have two. The shelf beside the couch is an old whiskey display that my father-in-law brought me a few years ago. I painted it white, and it is one of my favorite pieces in our home. Most of the furniture pieces in our home started out dark or in bad shape, and I have painted them with Chalky Finish Paint. 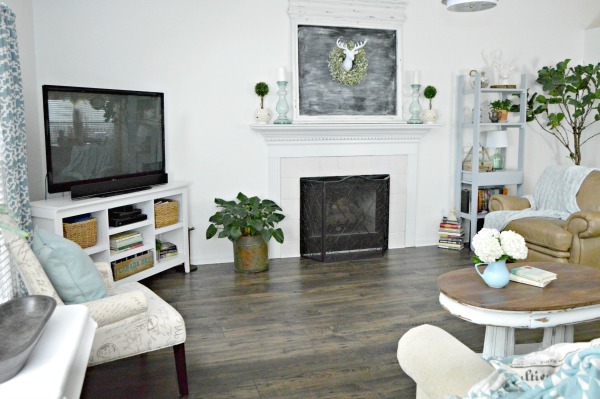 I love chalk based paint…it adheres to furniture with no sanding and really sticks. A little goes along way, so you don’t have to spend a ton of money to change the look of a piece of furniture. I just got these faux paperwhites in the mail yesterday! They are from Magnolia Market (you know, Joanna Gaines shop from the HGTV show, Fixer Upper). They really make it feel like spring! Our living room leads into our dining area, which is right off of our kitchen. That grey cabinet that you see on the left used to be a cherry wood and glass curio cabinet. I painted it glass and all with Chalky Finish Paint in Relic a few weeks ago so I could store my crockpot, pressure cooker and other kitchen gadgets in there without having to look at them. There are two more pieces from Magnolia Market in our dining area too. My husband bought me the “Today is a good day for a good day” metal sign for Christmas, and I bought myself the amazing Farmhouse Serving Plank that you see in the middle of our table. I use it to serve dinner on in the evenings, and it’s great to use when we have guests over as the world’s largest cheeseboard. This is the view from the living room that shows how our dining space, kitchen and breakfast nook/office are all connected. This is where I spend most of my time. I created a kitchen island using a sideboard that I found at Wayfair. It houses my cookbooks, some fun dishes, our indoor grill and is where I do all of my meal prep when cooking dinner. Since we are super limited on cabinet space, I added hooks to each side to hold my colanders and strainers. I removed some of our cabinet doors so I could see my dishes. Our kitchen cabinets were originally cherry, and in really rought shape, so I painted them using chalky paint too. The backsplash is actually peel-and-stick faux wood flooring planks that look a lot like our wood floors. I wanted a rustic look, but nothing too permanent. This is the second time I’ve used this product for a backsplash, and I love it. You can see the tutorial I shares showing how to use them as a backsplash HERE! It’s by far one of my most popular posts! This is where the business of blogging happens. I LOVE all things aqua, and white of course, so this is my favorite space…it inspires lots of creativity. It can see our patio and back yard from here, and the windows let in a ton of light. And of course…I have plants everywhere! Those hanging planters are from IKEA. I saw them in one of their commercials and had to have them. You can even see the cat food bowl tucked in beside my smaller Fiddle Leaf Fig plant. Just keepin’ it real here. So, that’s a quick tour of our little home. You can find our Blue and White Bedroom HERE and our Back Patio HERE! Now onto some more small house goodness! 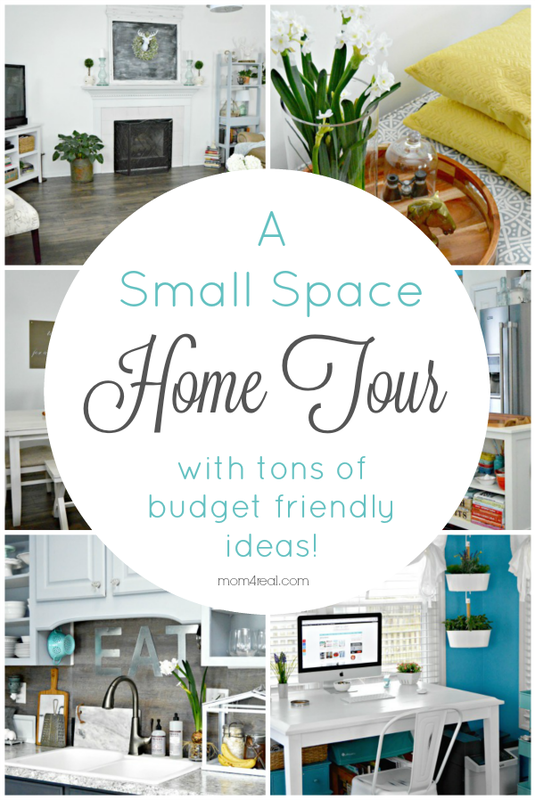 Be sure to check out the rest of the small home tours below! WOW….loved the tour of your home. Your place looks soooooo fresh and inviting. You are SO CREATIVE. Will be trying the “chalky Paint” on some of my stuff. I have never heard of it before. Who makes it….etc. I loved taking the tour of your small house. I also have a small house and have come up with some ideas for storaage, etc., etc., etc. My colors are different, but, still make my rooms look larger. I love the faux wood backsplash – I would have never thought of that! I think it would even be a good idea as a backdrop for food photo shots. So crisp, fresh and clean! Great job! Love everything. Now it is time to enjoy the fruits of your labor with your family and friends. 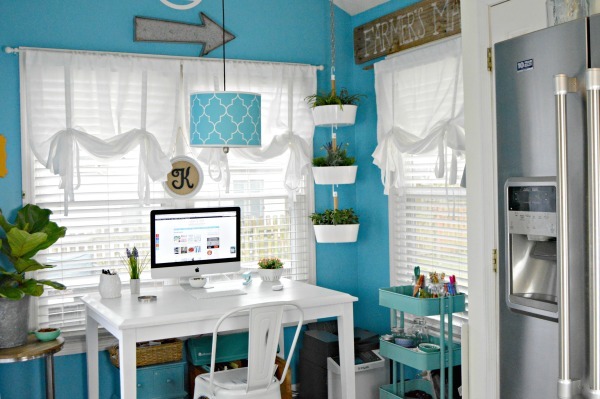 Where did you find the white curtains hanging in your blogging space? I LOVE them. You have a beautiful home. I went from a 1,400 sq ft house to a 2,600 sq ft house thinking we “needed more space.” We didn’t like it; it was terrible to keep clean and we seemed so far away from each other in the same house. We downsized back to an 1,800 sq foot home and I am so happy we did. It is cozier and we seem closer as a family again. It’s so weird how the size of a house can do that. Love the home tours! Hi, Miranda! I bought them at Target! You know, it’s funny, we have tons of friends that live in huge homes and they have encouraged us to move “up” as well. When we take a step back, we see the disconnect in some of their families. I feel like everybody just goes off to their own space and you really lose the family closeness. Thanks so much for stopping by!!! Thanks do much for sharing your home! 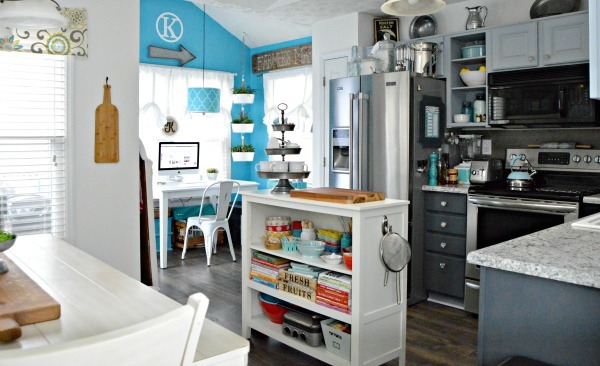 I, too live in a small space…400 square feet to be exact! 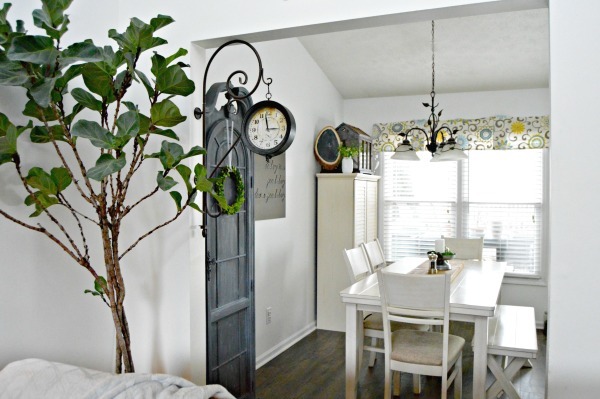 I love to decorate and have a blue, white, soft turquoise color scheme. Love your grey, too. I’ve never used the chalky paint but will try it soon. I’m refinishing my cabinets and kitchen arrangement at the moment…have you ever painted your countertops? I have laminate but would love to have the look of marble or granite. Ideas? I have painted my countertops in the past. We recently had new ones installed after saving up for them. There are tons of countertop paint kits that work really well. I love the one Rustoleum has as Lowe’s. I adore your home! I want to be a landscape architect so I love plants too :) Thank you so much for playing along and being a part of the tour! Jessica! I love your home! Your office is in the perfect spot! I adore the pop of color! It is great to be on this tour with you! So pretty and not so perfect that min doesn’t instantly wonder what my kid will break. I envy your deeper desk. My goal is to so more of my desk and less electronics very soon. I have this annoying Ooma phone and a ELEPHANT sized black printer taking up my Zen-space. Thanks for opening up your home to all the snoopers in the world including myself. Love the updated backsplash and it is exactly the look I am going for in my bathroom. It looks wonderful in your kitchen. I was wondering if you can share with us the painting technique and colors that you used on the updated kitchen backsplash. I am so anxious to get this project going. Would you mind telling people where the updated wood planks are from? It isn’t mentioned anywhere in this post. Hi Jessica.. I’m a 68 year old grandma,living a real small budget. Can’t afford anyone to remodel my tiny kitchen. Do have a DYI counter top suggestion? It has to be something I do myself.. Help please. I love the vinyl backsplash idea so much! I saw it on Pinterest and Remodelaholic and just posted a blog about how I wanted to tackle it this weekend for my bathroom! I was thinking about trying to get a white washed look but not sure if I can achieve that on vinyl? But I also love your updated version and the color you used! Now I’m even more excited to attempt this! Curious how your chalk paint is holding up in your kitchen? I’ve been contemplating it but read different reviews. I love your casita!!!!!! Did you use the planks behind the stove too? I’m afraid it will melt. For the peel and stick flooring used as the kitchen backsplash, how hard was it to remove them when you wanted to replace them? Did it do much damage to the wall? They were really easy to remove, and other than pulling a little paint off, there wasn’t much damage at all. I changed it out to a different peel and stick last year and it was pretty easy. 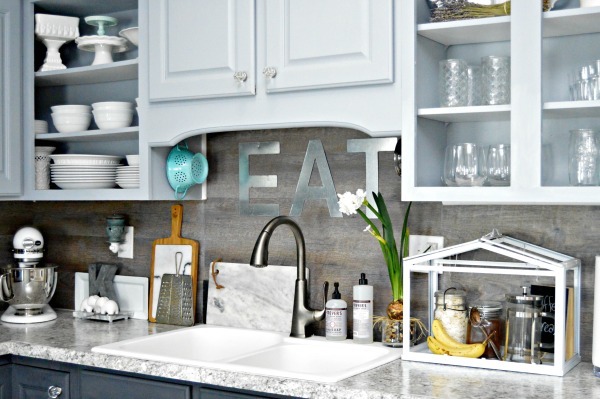 Love your back splash! I’m curious about the house you have your bananas and canisters in. Is it glass or just open? Where did you find that? Thanks, Anne! It’s a terrarium that I bought at IKEA years ago. I took out the side panels at one point and used it to house my canisters and bananas. Hi Jessica, I love the updated backsplash and thinking about this for my kids bathroom, I just purchased a great box of very realistic wood planks from Lowes, but feel a gray wash, similar to your second update would look better. I couldn’t find any info on the updated version. Could you share which tile you used, and the paint you used as well. Thank you so much. I love all these great ideas, but get overwhelmed at times!